My legs were feeling stiff from the mud that was caking on my skin, making it uncomfortable to bend at the knee as I ran. I knew what whatever lied ahead was going to test my strength, but I was determined to press on. While on the trail I was able to assess my condition, and I realized that my bruised legs would be horrifyingly black and blue for days to come and the scratches that I had accrued were starting to sting. I laughed a little under my breath as I jogged on: "Why I am doing this to myself?" I was surprised that my response was an instant and resounding, "Because it's not often that we get to play like this!" It's true! No matter how crazy some of the obstacles were throughout the Tough Mudder, I was loving life at every step. Being outdoors, challenging myself mentally and physically, surrounded by friends and helpful strangers was a breath of fresh air. I have never been an athletic person and even less of a competitive opponent. 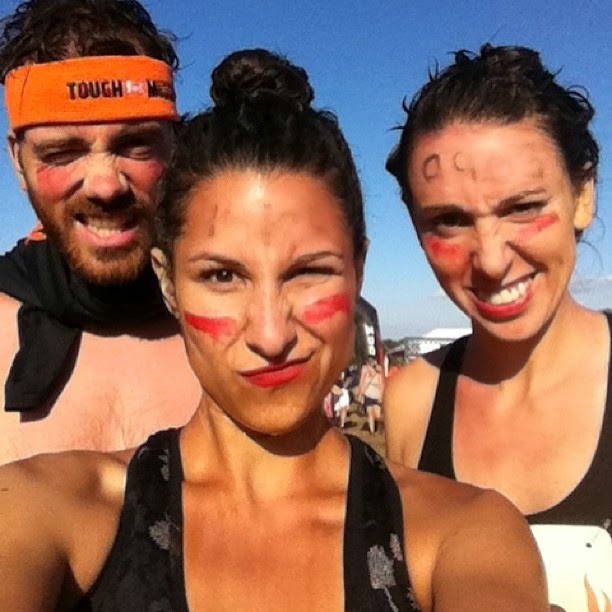 My first Tough Mudder was an intimidating venture, because I thought that I was going to be the weakest link in the team, and I feared the embarrassment of failure. It is important to physically prepare for these events so that you minimize the risk of injury. At that time, I maintained a relatively relaxed workout routine, though I by no means trained diligently for the race. From the beginning I was supported by friends that assured me that it was going to be a day dedicated to team work and fun. If you have ever considered the challenge of an obstacle course race, I highly recommend it! There are people of all different shapes and sizes that take the challenge, and the entire day is loaded with a palpable positive energy. I was pleasantly surprised to realize that no matter what physical condition you may be in there are obstacles that can hit everyone's strengths and weaknesses. I found it endearing when I came across a large beast of a man who was hesitant to start one of the obstacles. The burly guy was nervous about crawling through an underground tunnel that was pitch black once you were inside. I coaxed him in by telling him that I would follow closely behind him for support. We both made it out on the other side and he gave me huge bear hug because I had helped him through his fear of confined spaces. Thankfully we kept bumping into one another at other obstacles, and he was able to hoist me over huge walls that I could not do on my own. I have a few of these under my belt now. Without fail, I cry at the end of each race. To be honest, I'm not exactly sure why I get so emotionally overwhelmed, but I do know that the entire day of activities exhausts me. After a good 20 seconds of emotional release, happiness overrides and hunger proceeds! It is important to fuel up after such rigorous activity, and let me tell you that the first meal after the event is a glorious, well-earned experience. * The only one you are competing with is yourself! - The challenges are fun and unique to test your abilities. If you are unable or unwilling to do one of the obstacles you are free to walk around and skip it. I loved feeling free to laugh at myself during my failed attempts, and I relished the feeling of success when I completed an obstacle. 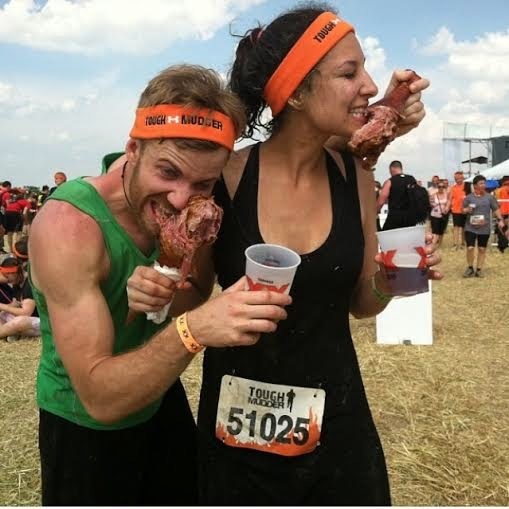 I finally completed the monkey bars on my 3rd Tough Mudder, and I couldn't have been happier. High-fives never felt so good! * You get to move your body like a kid again - I never realized how liberating it was to run, jump, crawl, swim, reach and stretch! I was brought back to the feeling of recess where everyone just let loose and had fun. I definitely had to push myself to complete the race, but I enjoyed the opportunity to move my body in ways that I do not do on a daily basis. * Camaraderie - The whole day is full of those connections that Sweat and Butter tells you to seek out. We explain the importance of being present and mindful with yourself and others. They are not necessarily life-changing interactions but having a the same goal as everyone else, people cheering you on and even simply acknowledging the people around you makes for a special environment. * The challenge - I cannot tell you enough how much self doubt I discovered during these events. Knowing that I had all day to complete the course gave me some solace, but I had to counsel myself just to keep going. The course allowed me to take physical obstacles head on even when I knew that failure was almost a guarantee. It was clear to me that, whether obstacles were physical or mental. overcoming that self doubt requires a first big step. I have been able to translate that experience into many life experiences such as avoiding a big project that needs to be done at work where the pressure was too daunting to even get started. This fueled many ah-ha moments for me throughout the day. I enjoyed proving myself wrong over and over again by saying, "See you can do it!" If you have been curious about doing one of these events I suggest that you leave your reservations at the door and sign up! Get a group of friends together and make it a bonding day for everyone. You can dress up around a specific theme or just go in with the ultimate goal of pushing yourself past your comfort zone. If you have been needing some extra encouragement, having a goal like an obstacle race is also a great motivator to get active and stay healthy throughout the process before the big day. **Disclosure: I am not writing on behalf of or for the Tough Mudder or any other obstacle races. All opinions are my own, and these are personal stories of my experience with races. Stephanie Telep is a co-owner and health coach at Sweat and Butter. She received her training at the Institute for Integrative Nutrition and holds a bachelor’s degree in Psychology from Duquesne University. She hopes to help others make necessary changes in their lives while fostering a positive and healthy attitude. She can be reached at stephanie@sweatandbutter.com.